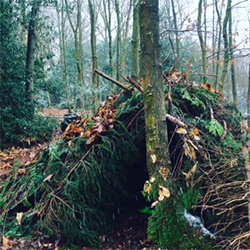 Join Mel and learn how to build a shelter than can withstand wind and rain as well as make it as camouflaged as you possibly can using natural materials we forage for in the wilderness. We will venture into the wood and get into teams and build a shelter to be proud of! All the dens built will have fun tests at the end while you are sat inside! Classes & Workshops Important Info. All workshop attendees must meet in the cafe garden 10 minutes before the workshops starts! We look forward to seeing you there!